I am saddened by the passing of Senator Kennedy. Although I did not agree with many of his policies, he stood for something very important. I believe he stood for bipartisanship, whenever possible. 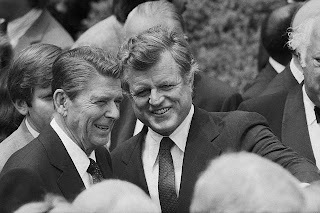 For all of the terms Senator Kennedy served in the Senate, he learned how much more could be accomplished when you obtain support from both sides of the Senate aisle. Too many politicians today seek to further their own careers or the goals of their respective parties at the expense of getting something done. If we all pursued our own self interest all the time, America would suffer in the long run. The Founders set up our Legislative and Executive branches to protect us all from the tyranny of the majority. In doing so, the stage was set for Congressional gridlock, which can only be resolved with true bipartisanship. In such a setting, everyone’s voice is, or has the potential to be heard. Can anyone plausibly argue a contrary means to effecting meaningful legislation that benefits the greater good for all?